Honeywell, a Fortune 100 company providing software-oriented solutions for many of the world’s most complex industries, will relocate its global corporate headquarters from Morris Plains, New Jersey, to Charlotte, North Carolina. The company’s move will create 750 well-paying jobs in Charlotte and more than $248 million in real and personal property investment. “Charlotte is a top-10 destination city in the U.S. that will readily enable us to recruit and retain the world-class talent we will need over the long term to support Honeywell’s strategic focus on leading technology and software solutions within our end markets,” said Darius Adamczyk, Honeywell chairman and chief executive officer. Honeywell is a Fortune 100 technology company that invents and manufactures technologies that address some of the world’s most critical challenges around energy, safety, security, productivity and global urbanization. Honeywell blends physical products with software to support connected solutions that improve buildings, factories, supply chains, utilities and aircraft. About 150 to 200 New Jersey-based Honeywell senior management positions and about 100 South Carolina-based positions will relocate to Charlotte by September 2019, according to a Honeywell news release. 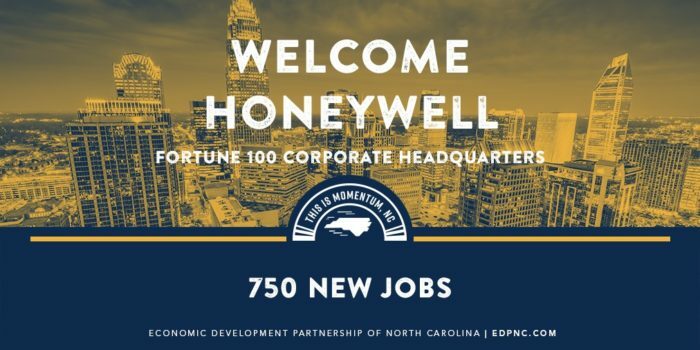 The company will gradually add about 500 Honeywell corporate and SPS positions in Charlotte over the next five years, bringing total employment there to about 750 by the end of 2024. Approximately 1,000 Honeywell employees will remain in New Jersey across the company’s six locations there, including about 800 employees in Morris Plains, the company said. The state Department of Commerce and the Economic Development Partnership of North Carolina (EDPNC) led the state’s support for the company’s move. Honeywell’s headquarters location in Mecklenburg County will be supported, in part, by a state Job Development Investment Grant (JDIG) approved Monday. Over the 12-year term of the grant, the project will grow the state’s economy by an estimated $7.9 billion. Using a formula that accounts for the new tax revenues generated by the new jobs, the JDIG agreement authorizes the potential reimbursement to the company of up to $42.45 million spread over 12 years. State payments only occur after the company has met its incremental job creation and investment targets. Because Honeywell chose to locate in Mecklenburg County, classified by the state’s economic tier system as Tier 3, the company’s JDIG agreement also calls for moving as much as $14.15 million in new tax revenue generated through the grant into the state’s Industrial Development Fund – Utility Account. The Utility Account helps rural communities finance necessary infrastructure upgrades to attract future business. Partnering with state Commerce and the EDPNC on this project are the North Carolina General Assembly, the North Carolina Community College System, Mecklenburg County and the City of Charlotte and the Charlotte Regional Business Alliance.